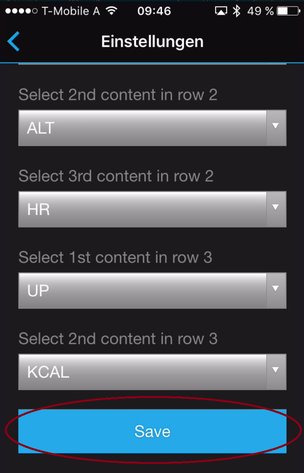 Change Configurations - RH-SPORTS Website! 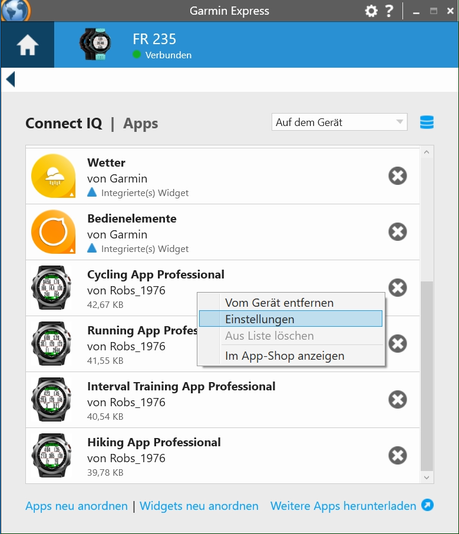 All configurations can be changed on your PC or MAC by using the Garmin Express Software. Before changing configurations, please make sure that you have installed the latest software version. 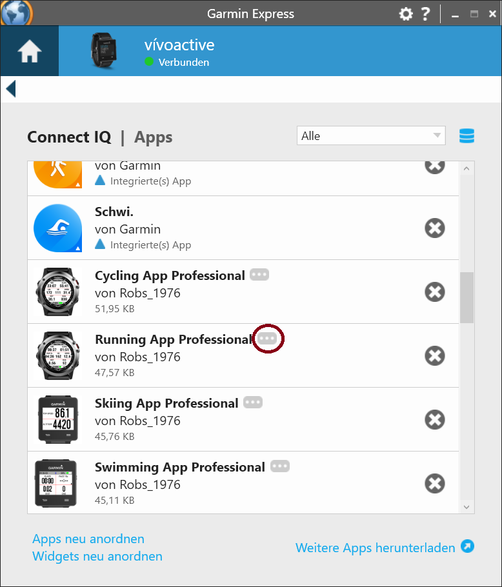 The software can be downloaded from the official Garmin web site. 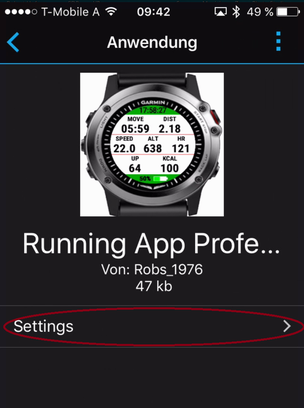 Look for the symbol as shown on the left side and double-click it to start the Garmin Express software. 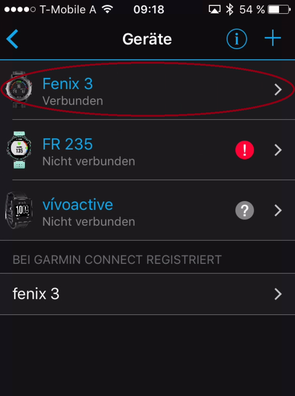 After that you should be able to see your Garmin wearable as shown in the picture below. If not, please add your device first. For details refer to the documentation provided by Garmin. Connect your wearable via USB to your PC/MAC. 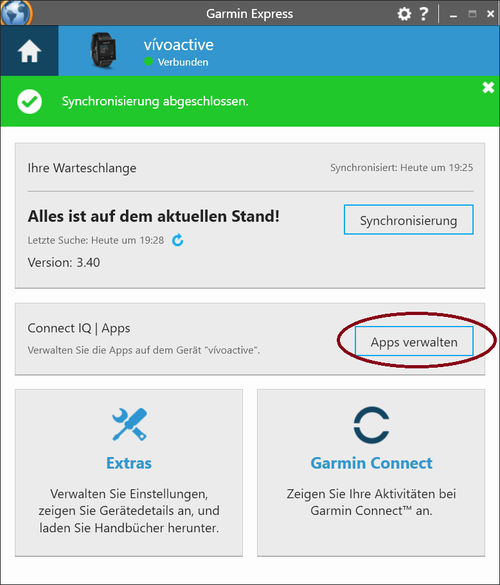 Your wearable should be automatically detected and the Garmin Express software starts a synchronization process. When everything is ok, it is signlized via green lights as shown in the figure below. In case problems occur, please refer to the documentation provided by Garmin. 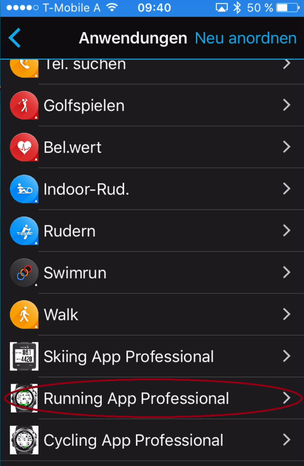 to the app of your choice as shown in the right picture above. 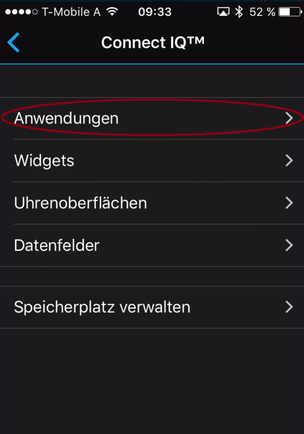 A context menu will be shown where you have to select "Settings"
Please note that configuration changes ONLY apply on your wearable if you have entered the proper PREMIUM key in the field marked in the picture below. The key consists of two times four characters separated by a space in between. If the proper key is entered, please make the configurations according to your needs and press the "Save" button at the end. 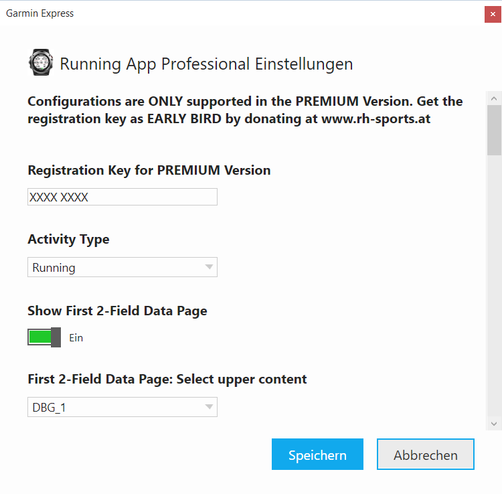 The Garmin Express Software will update the configurations on your wearable. In case of errors, please refer to the documentation provided by Garmin. 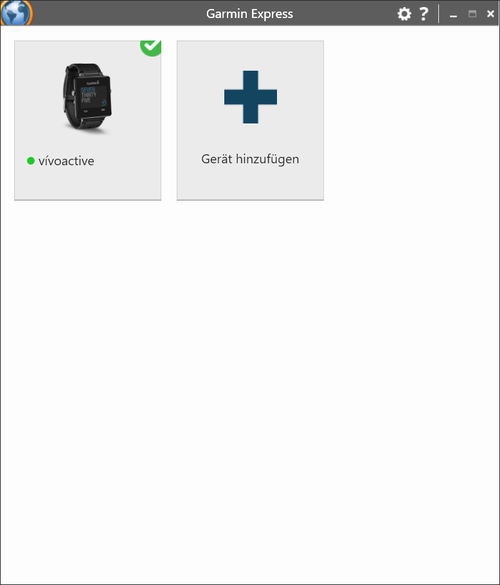 After the configuration changes were saved, disconnect your wearable from the PC/MAC. Please start your application on your wearable. 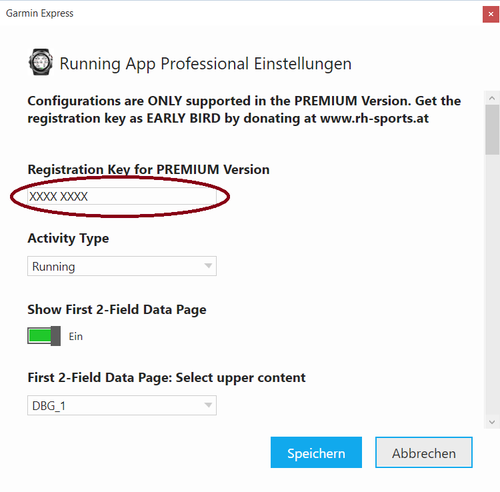 If you have the PREMIUM Version (key was correct), then your configuration changes should have been applied. If not, please refer to our Frequently Asked Questions. 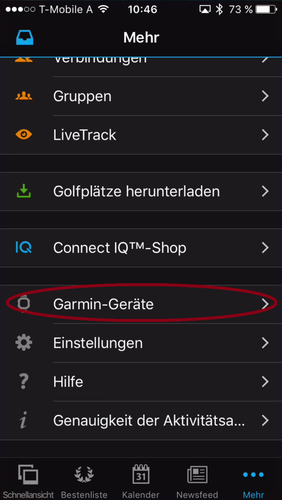 Look on your mobile phone for the app with the symbol shown on the left side and click it to start the Garmin Connect™ Mobile app. A similar window as shown below should appear. After pressing the button with the dots on the lower right side (as marked above) a new windows appears. Please scroll down until you find the entry "Garmin Devices". After pressing the button marked above, a window with all your registered Garmin devices appears (see picture below). If you cannot find your device, please add it before by clicking on the upper right "+" sign. For further details, please refer to the documentation offered by Garmin. 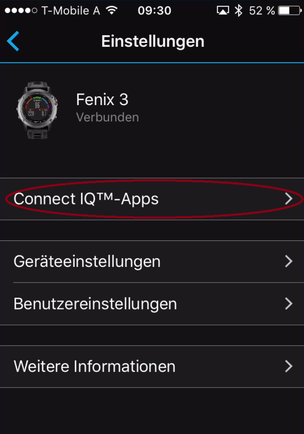 Then select one of your connected device. Please click the marked button in the picture below following by clicking to applications. Please click on Settings as marked below. If the proper key is entered, please make the configurations according to your needs. Finally scroll down and press the "Save" button. 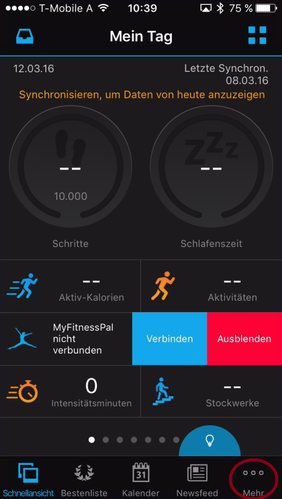 The Garmin Mobile App will update your configurations on your wearable. In case of communication errors, please refer to the documentation provided by Garmin.